What is the purpose of The Khitma Project? The Khitma Project is an annual project hosted by Rabata to encourage individuals across the globe to reach their potential with the reading of the Qur’an during the spiritual month of Ramadan. We believe in the transformative power of the Quran and Ramadan, so during the month we set Quran goals with the intention of individual and global spiritual advancement and healing. This is the month of “IQRA” / “READ” and we challenge ourselves, and you, to recite as many complete readings of the Holy Book, in Arabic, as possible. A khitma is an Arabic word that refers to the complete reading of the Quran from the first sura to the last, in Arabic. How can I submit my khitma? You can email Rabata whenever you complete your khitma with your location (city/country). 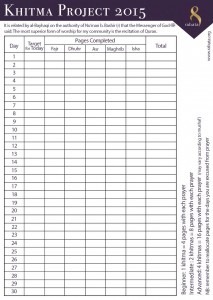 Also, keep track of your Quran reading by printing this pocket-size Ramadan Khitma Project table.